A self-professed Ninja, 7-year-old Brycen Fleming was thrilled to start Tae Kwon Do lessons. While he’s also an excellent soccer and basketball player, Tae Kwon Do is one of his favorite activities. “It’s intriguing and lets me practice my Ninja moves,” Brycen says. He’s been taking lessons at the Fayetteville location since November and loves that his brother Andrew takes lessons as well. Brycen has rapidly moved up the ranks to achieve the rank of blue stripe. “Brycen is constantly practicing his moves at home. He loves Tae Kwon Do, and I can see the pride he takes in every belt test he passes, and every level he advances,” notes mom, LaKeisha. Presenting this month’s Student Profile, Brycen Fleming. Why do you like taking Tae Kwon Do? What do you enjoy about taking lessons at Master Shim’s World Class Tae Kwon Do? It’s challenging. It helps you try to be strong like a Ninja. How does Tae Kwon Do increase your confidence? I get more confidence in my kicks. What do you think of the instructors at Master Shim’s? The instructors are good because they are black belts and they know what they are doing. 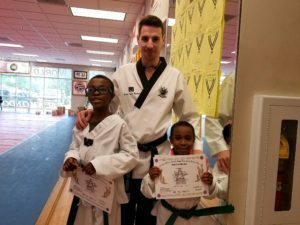 Why should someone else consider taking Tae Kwon Do? They should take it to get some exercise.